For other uses, see Bash Brothers (disambiguation). Mark McGwire (left) and Jose Canseco (right) were named Rookie of the Year in consecutive years. 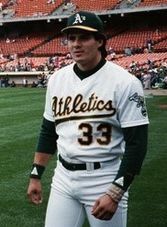 Canseco was drafted by the Oakland A's in the 15th round of the 1982 MLB Draft. He did not become a legitimate power hitter until he began weightlifting in late 1984 and gained 35 pounds (16 kg) of muscle. In 1985 he jumped from AA to AAA to the major leagues, and batted .300 at each level. In 29 games with Oakland that season, he batted .302 with five home runs (HR) and 13 runs batted in (RBI), and hit a combined 41 HR with 140 RBI at all levels that year. McGwire played college baseball for the USC Trojans, and set a school record with 32 HR in his junior year. He played for the United States national team in the 1984 Summer Olympics before being selected by the A's in the first round of the 1984 draft. In two-plus years in the minor leagues, McGwire hit 48 HR. He debuted with the A's as a third baseman in August 1986. The outfielder Canseco was named the American League (AL) Rookie of the Year in 1986 when he hit 33 homers, and McGwire captured the award the following season, when he was moved to first base and hit a league-leading 49 home runs, a major-league record for rookies. The two combined for over 200 home runs as Oakland captured the AL pennant in three consecutive seasons from 1988 though 1990, winning the World Series in 1989. In 1988, Canseco was unanimously voted the AL Most Valuable Player after batting .307 and leading the majors with 42 HR and 124 RBI. He also added 40 stolen bases (SB), which combined with his home run total made him the first major leaguer to ever reach the 40–40 club. That year, Canseco and McGwire began a ritual of meeting at home plate and banging their massive forearms together with closed fists to briefly form an "X" when either of them hit a home run. Dubbed the Monster Bash, it soon replaced the customary high five as the team's preferred post-homer celebration. The practice was mimicked by Little Leaguers, college players, and minor leaguers. It was also performed by the United States national team at the 1988 Summer Olympics in South Korea. At the Oakland Coliseum, T-shirts and banners bore "Let's Bash". A song and complementary music video was made to the tune of "Monster Mash", the 1962 hit by Bobby "Boris" Pickett, with almost a dozen radio stations placing the new "Monster Bash" on their playlists. Costacos Brothers Inc., an innovative poster company, had already planned a photo shoot with the slugging duo for a concept that was originally titled the "Blast Brothers", but the advent of the forearm bashing motivated a change to the "Bash Brothers". The poster was patterned after characters popularized by comedians Dan Aykroyd and John Belushi. Canseco and McGwire were made to look like a bigger and meaner version of The Blues Brothers who were also partial to some yellow in their attire—yellow being an A's team color along with green. Wearing black suits, black shoes, black hats, black sunglasses, yellow socks, yellow shirts, skinny ties, and fedora hats, the duo posed in front of an Oakland Police patrol car while holding giant 5-foot (1.5 m) baseball bats. The poster sold 50,000 copies in the San Francisco Bay Area in less than three weeks. It was as popular as any poster that Costacos had done, and it received immense press coverage. Due to the frequency and distance of their home runs, the Bash Brothers were a popular attraction in every American League city. McGwire became the first player in major league history to hit 30 home runs in his first four seasons (1987–1990), and Canseco led the majors in homers for the second time with 44 in 1991. However, the Athletics finished in fourth place in the AL West in 1991 after having made three straight trips to the World Series. At the trade deadline in 1992, Oakland traded Canseco to the Texas Rangers for outfielder Rubén Sierra, relief pitcher Jeff Russell, and starting pitcher Bobby Witt. The A's at the time were 27 games above .500 and leading their division by ​7 1⁄2 games, but they had played 34 of 131 games without Canseco, and were seeking to strengthen their pitching. He had homered 231 times with the A's since 1985, and was arguably the biggest celebrity in baseball at the time. However, Canseco had played over 135 games in a season just once since 1988, and his off-the-field antics had drawn criticism as well. After four seasons with Texas and one with Boston, Canseco returned to Oakland in 1997. The A's had been languishing for three seasons with a combined 196–224 record, and were having a nondescript offseason before acquiring him for pitcher John Wasdin. Reuniting him with McGwire, who together were once one of the most explosive tandems in baseball, boosted the team's ticket sales considerably. McGwire was coming off of a majors-leading 52-homer season, and Canseco remained a threat with his tremendous bat speed. However, McGwire's contract was expiring at the end of the season, and he was traded mid-season to the St. Louis Cardinals for pitchers T. J. Mathews, Eric Ludwick, and Blake Stein. Canseco's season was just ordinary, and he signed in the offseason with the Toronto Blue Jays, his fourth team in four years. During their careers with Oakland, Canseco and McGwire combined to hit 617 home runs. With Toronto in 1998, Canseco played in 120 games for the first time since 1991, and reached 100 RBI for the first time since 1991. In his last big season, he had 46 HR, 107 RBI, and 29 SB for the Blue Jays. He became a journeyman designated hitter before retiring in 2002. He fell 38 home runs short of joining the 500 home run club, a milestone he had hoped to reach to bolster his chances of being inducted into the National Baseball Hall of Fame and Museum. Unable to find a job to prolong his career, he accused teams of blackballing him. McGwire hit 70 home runs in 1998 to break Roger Maris' long-standing major-league record of 61. It was the highlight of a four-year stretch from 1996 though 1999 in which McGwire hit 245 homers. He finished his career with 583 home runs, and averaged one homer every 10.6 at-bats in his career for the best at bats per home run ratio in major league history. He was considered a likely inductee into the Hall of Fame until allegations of his illegal use of steroids. On September 28, 1988, sports columnist Thomas Boswell of The Washington Post appeared as a guest on CBS News Nightwatch and alleged that Canseco, who was on his way to winning the MVP award that season, was "the most conspicuous example of a player who has made himself great with steroids.” Boswell did not print the allegations in the paper. According to George Solomon, who was the Post's sports editor, the newspaper required 100 percent certainty in what it published. "What Boswell said on CBS was Boswell’s opinion,” Solomon said. In October against Boston during the 1988 American League Championship Series, Red Sox fans at Fenway Park loudly chanted "Ster-roids! Ster-roids!" when Canseco was on the field. He denied the charges, and steroids at the time were not covered in the federal government's Controlled Substances Act. During his home run record chase in 1998, McGwire was spotted with a bottle of androstenedione in his locker by Steve Wilstein of the Associated Press, which he eventually admitted to using. An over-the-counter bodybuilding substance, andro was a type of anabolic steroid that had been banned in other sports, but not yet in baseball. “Everybody that I know in the game of baseball uses the same stuff I use,” McGwire said. After setting the home run record, he announced that he had stopped using the substance to avoid setting a bad example to young kids. Meanwhile, the locker discovery was written off by the public as the work of prying reporter. In 2005, Canseco admitted to using steroids in his book Juiced: Wild Times, Rampant 'Roids, Smash Hits & How Baseball Got Big, which stated that he and McGwire injected steroids together while with Oakland. The book also accused other prominent players of using steroids. McGwire initially denied the allegations, before refusing to comment on steroids during a congressional hearing the following month. In 2010, he too admitted to using steroids. Canseco expressed regret in writing his book and apologized to McGwire in 2014, but his former teammate has spurned multiple attempts at reconciliation. ^ Neff, Craig (April 14, 1986). "Those Baby Boomers". Sports Illustrated. Archived from the original on April 9, 2015. ^ Walker, Ben (April 6, 1986). "Which Rookie Will Rise to Major League Stardom This Year?". Los Angeles Times. Archived from the original on April 9, 2015. ^ a b c Wilstein, Steve (October 11, 1987). "A Year to Remember". Los Angeles Times. Associated Press. Archived from the original on April 8, 2015. ^ a b "McGwire on Hall of Fame Ballot for Sixth Time". National Baseball Hall of Fame and Museum. Archived from the original on April 9, 2015. ^ a b c d e f Curry, Jack (February 13, 2005). "For Canseco and McGwire, Little Brotherly Love". The New York Times. Archived from the original on April 8, 2015. ^ a b Berg, Ted (July 24, 2014). "Mark McGwire on Jose Canseco: 'I don't care to ever speak to him again.'". USA Today. Archived from the original on April 8, 2015. ^ a b Shapiro, Mark (January 28, 1997). "Canseco Trade Reunites Bash Brothers". Chicago Tribune. Archived from the original on April 8, 2015. ^ Chass, Murray (November 17, 1988). "It's Unanimous: Canseco M.V.P." The New York Times. Archived from the original on April 9, 2015. ^ a b c d Wilstein, Steve (October 16, 1988). "Bash, it's a smash". Santa Cruz Sentinel. Associated Press. p. B-6. Retrieved April 7, 2015 – via Newspapers.com. ^ Stevenson, Seth (November 27, 1997). "Signs and Wonders". Slate. Archived from the original on April 10, 2015. ^ a b "The Bash Brothers". The Register-Guard. June 18, 1988. p. 2C. Retrieved April 8, 2015. ^ a b "Oakland hitters Bash their way into spotlight". Chicago Tribune. April 27, 1988. Section 4, p. 2. Retrieved April 10, 2015. ^ Davis, Craig (September 5, 1988). "Big Bash Theory Helps Create A World Of Wins For Athletics". Sun-Sentinel. Archived from the original on April 8, 2015. ^ a b c Tafoya, Dale (2008). Bash Brothers: A Legacy Subpoenaed. Potomac Books. p. 138. ISBN 9781597971782. Retrieved April 10, 2015. ^ Stewart, Mark (2008). The Oakland A's. Norwood House Press. p. 14. ISBN 9781599531700. Retrieved April 10, 2015. ^ Penner, Mike (October 14, 1988). "THE WORLD SERIES: ATHLETICS vs DODGERS : NO WONDER THESE GUYS GET . . . STRAIGHT A'S". Los Angeles Times. Archived from the original on April 8, 2015. ^ Shea, John (May 24, 1998). "McGwire glad to see Brother is holding up his end again". San Francisco Chronicle. Archived from the original on April 8, 2015. ^ a b Kurkjian, Tim (April 27, 1992). "A's O.K. If you counted the Oakland Athletics out, count again. They're flying high once more". Sports Illustrated. Archived from the original on April 9, 2015. ^ "MAJOR LEAGUE ROUNDUP : Fielder, Canseco Are Stuck on 44 at the Finish". Los Angeles Times. Associated Press. October 7, 1991. Archived from the original on April 9, 2015. ^ a b c Jaffe, Chris (August 31, 2012). "20th anniversary: Canseco trade". The Hardball Times. Archived from the original on April 8, 2015. ^ a b c Montville, Leigh (September 14, 1992). "Texas-sized Trade The Oakland A's sent superstar Jose Canseco to the Rangers in a deal that was both bold and bewildering". Sports Illustrated. Archived from the original on April 8, 2015. ^ Newberg, Jamey (August 23, 2007). "Swapping Stories: The Canseco trade". MLB.com. Archived from the original on April 8, 2015. ^ a b c Anderson, Lars (March 10, 1997). "4 Oakland Athletics". Sports Illustrated. Archived from the original on April 8, 2015. ^ a b Kettman, Steve (August 5, 1997). "A's Made A Big Mess Of Things". San Francisco Chronicle. Archived from the original on April 8, 2015. ^ "Worst baseball deadline trades". ESPN.com. August 8, 2002. Archived from the original on April 9, 2015. ^ Camps, Mark (February 28, 1998). "Canseco Is Still a Threat at the Plate". SFGate.com. Archived from the original on April 8, 2015. ^ Riess, Steven A. (2006). Encyclopedia of Major League Baseball Clubs. Greenwood Publishing Group. p. 788. ISBN 9780313083068. Retrieved April 7, 2015. ^ a b Diaz, George (May 2, 2001). "Slugger For Hire". Orlando Sentinel. Archived from the original on April 8, 2015. ^ a b Antonen, Mel (May 15, 2002). "Canseco's retirement stirs Hall debate". USA Today. Archived from the original on April 8, 2015. ^ "N.L. ; Jose Canseco Retires, 38 Homers Shy of 500". The New York Times. May 14, 2002. Archived from the original on April 8, 2015. ^ Fine, Mike (January 12, 2010). "Mark McGwire admits using steroids – who's next?". The Register-Mail. Archived from the original on April 8, 2015. ^ Kepner, Tyler (January 11, 2010). "McGwire Admits That He Used Steroids". The New York Times. Archived from the original on April 9, 2015. ^ a b c Curtis, Bryan (January 8, 2014). "The Steroid Hunt". Grantland. Archived from the original on April 8, 2015. ^ Caple, Jim (April 29, 2013). "Game changer? It was in the cards". ESPN.com. Archived from the original on April 8, 2015. ^ a b c Vecsey, George (January 12, 2009). "Voters Cannot Forgive or Forget Suspicions of McGwire's Drug Use". The New York Times. Archived from the original on April 9, 2015. ^ Roberts, Selena (August 26, 2005). "Truth Has Been Sullied Too Many Times". The New York Times. Archived from the original on April 9, 2015. ^ a b Hancock, David (February 10, 2005). "Steroid-User Canseco Names Names". CBSNews.com. Archived from the original on April 8, 2015. ^ Saxon, Mark (July 24, 2014). "McGwire on Canseco: 'It's too late'". ESPN.com. Archived from the original on April 9, 2015.